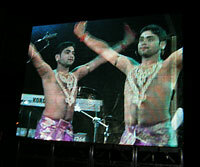 Rhythm of Life was inspired by the desire to promote Indian art and culture throughout the world. With the best wishes and greetings of Her Majesty The Queen of England, His Royal Highness The Prince of Wales, The Consul General of India and other officials, Sandeep commenced a world cultural tour Rhythm of Life in January 2008. The tour journeyed across the five continents. In collaboration with various High Commissions of India, Sahaja Yoga and other organisations, Sandeep took Kuchipudi to new audiences, many of whom had never seen any Indian dance form before. The overwhelming response of the audiences and the continual cultural exchange was most inspiring. Sandeep felt it was a blessing and a joy to meet people from all walks of life, with entirely different life experiences and perspectives who are nevertheless connected to one and other through their passion for dance. Due to the keen interest in Kuchipudi and popular demand of the audiences and students, Sandeep created Bhakti – Essence of Life in 2009, a further tour of the South American continent. Now as a member of UNESCO’s International Dance Council – CID, Sandeep will be touring the South and North America, Asia and Europe in 2010. 16th October, Rotary Club of Edgbaston, Hotel Paragon, Birmingham. 19th June, San Marcos National University, Lima. 23th June, Agriculture National University, Lima. 26th June, San Martin de Porres University - Medicine, Lima. 28th June, Municipality of Trujillo, Lima. 30th June, Engineering National University, Lima. 1st July, Municipality of Jesus Maria, Lima. 11th June, Casa de la Cultura Ecuatoriana, Teatro Nacional, Quito. 12th June, Universidad Politécnica Salesiana (Teatro Bartolome de las Casas), Quito. 12th June, Teatro Municipal de Machachi, Machachi. 15th June, Universidad San Francisco (Teatro Calderon de la Barca), Quito. 07th May, El Bosque University, Bogota. 09th May, Gobernacion Del Tolima (Government Hall), Ibague. 13th May, SENA University, Bogota. 14th May, National University of Colombia. 15th May, Foundation San Martin University, Barranquilla. 16th May, Hotel Puerta Del Sol, Barranquilla. 16th May, AVHOS Autonoma University, Barranquilla. 17th May, Marleny School of Arts, Barranquilla. 19th May, Gimnasio Del Norte College, Valledupar. 19th May, Loperena National College, Valledupar. 20th May, Alcaldia De Valledupar (Government Hall), Valledupar. 27th May, Antioquia University, Medellin. 28th May, Envigado College, Medellin. 28th May, National Universitu, Medellin. 05th June, National University of Colombia, Bogota. 27th February, Centro de Convivência, Campinas, Sao Paulo. 28th February, Centro Cultural Adamastor, Guarulhos. 05th March, Escola Brigadeiro Faria Lima children, Sao Paulo. 06th March, Teatro Municipal Sylvia A Matheus, Vinhedo. 07th March, Auditório da FAFIL Universidade, Santo André. 11th March, Teatro Renascença, Porto Alegre. 14th March, Museu Nacional, Brasilia. 15th March, Museu Nacional, Brasilia. 16th March, Teatro do SESI, Taguatinga, Brasilia. 22nd March, Teatro Francisco Nunes, Belo Horizonte. 25th March, Teatro do SESI, Vitoria. 30th March, Teatro Jorge Amado, Salvador. 01st April, Teatro Municipal de Niterói, Rio de Janeiro. 02nd April, Teatro do SESI, Rio de Janeiro. 03rd April, Teatro Arthur Azevedo, Campo Grande, Rio de Janeiro. 23rd January, Kalaaradhana, Nizamabad, India. 26th January, Swadesi Mela, Nizamabad, India. 19th October, Diwali Festival Hindu Samaj, Protea Complex, P.M.B. 20th October, Mt.Edgcombe MariamemTemple, Durban. 24th October, Phoenix Plaza Diawali Festival, Durban. 25th October, Chatsworth Diwali Festival, Durban. 26th October, Sahaja Yoga Festival, Nedbank, P.M.Burg. 02nd September, Junior Chamber of International, Nizamabad. 02nd July, Silpakorn University, Bangkok, Thailand. 03rd July, Press, Patravadi Theatre,Siriraj, Bangkok. 04th July, Performance, Patravadi Theatre, Bangkok Noi. 07 June, Richmond, Blue Mountains. 03rd May, Papakura Community Hall, Auckland. 01st March, Centro Cultural Adamastor, Guarulhos, Sao Paulo. 02nd March, Espaço Cultural Homens do Brasil, Sao Paulo. 07th March, Teatro Noel Rosa - UERJ, Rio de Janiero. 08th March, Teatro popular Caminho Niemayer, Niteroi. 09th March, Teatro popular Caminho Niemayer, Niteroi. 14th March, Usina do Gasometro, Porto Alegre. 15th March, Auditório do Banco do Brasil, Porto Alegre. 26th March, Teatro Glauber Rocha, Vitória da Conquista. 27th March, Centro de Cultural, Vitória da Conquista. 30th Match, Teatro do SESI, Taguatinga, Brasilia. 04th April, Sala Plínio Marcos - FUNARTE, Brasilia. 06th April, Casa da Cultura, Araguari. 12th April, Teatro SESI, Vitória. Telegu Association of Scotland, Diwali Celebration Performance, Glasgow. Intensive training with guru Sri Vedantam Radheshyam in Kuchipudi Village, Andra Pradesh, India. Dance Workshops in Sydney, Australia. Special guest performer at A Cultural Evening of Meditation, Music and Dance, Presented by Sahaja Yoga Australia, at Richmond School of Arts, Sydney. Presents International Dance Day solo dance performance of student Freya Jeffrey, Nizmabad, AP, India. Receives Natyacharya award, presented by International Theatre Movement's chairman justice D.P. Das Mohapatra, Cuttack Orissa. Sandeep presents dance performances by his Australian and Indian students at the International Children’s/Youth Play & Dance Festival 2007, Cuttack, Orissa. In Kuchipudi village with Padmasri Sri Dr Vedantam Satyanarayana Sarma & Sri Vedantam Radheshyam. India Theatre Olympiad International Theatre Festival Cuttack, Orissa. Sandeep presents his young Australian protege Freya Jeffrey and other senior students for their performances at the All-India Festival. Judge for Mc Donald's Little Miss & Master Hyderabad Talent Quest, NTR Gardens, Hyderabad. Sandeep Bodhanker performed The Dance of Grace at the Nehru Centre in London. Diwali Festival in WestMidlands. Millinium Point main stage.